Dallas, TX — Ro2 Art is proud to present Active 8: A Mini-Ennial in Texas Art – an exhibition curated by Ricardo Paniagua, including works by contemporary Texas artists Daniel Adame, Cande Aguilar, Angel Cabrales, Bernardo Cantu, Mario Garcia, Michael Anthony Garcia, Beto Gonzalez, and Ricardo Paniagua. The exhibition is produced in coordination with The McKinney Avenue Contemporary, with support by Arts+Culture Magazine. The opening reception will take place Friday, April 27 from 6 to 10pm. The exhibition opens April 20 and will run through May 5, 2012. The exhibition will take place at The Janette Kennedy Gallery at South Side on Lamar, 1409 South Lamar St. Dallas, TX 75215. 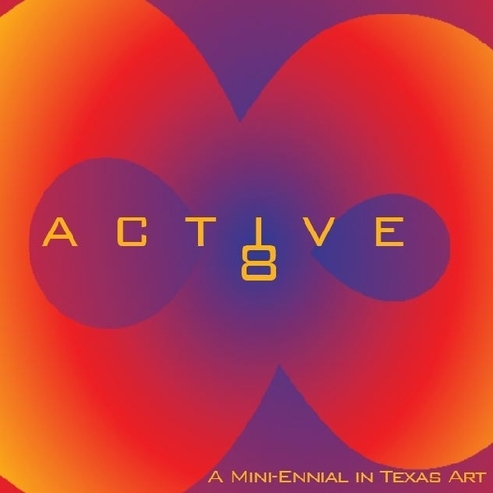 Active-8: A Mini-Ennial in Texas Art should be seen as a small-scale examination of solutions and/or responses to contemporary concerns by artists from within the interconnected art world of today who reside and create primarily from within the state of Texas. Talent from Denton to Brownsville, Houston to Austin, Dallas and San Antonio, all leading voices from within their communities, will merge to exemplify what has always been considered exciting, a “boat load” of cutting edge work with a fresh approach. Each artist represented within this exhibition demonstrates how and what it means to be concerned with new ideas in the 21st Century art world. Daniel Adame is a performing and visual artist living and working in Houston . He attended the U of H where he earned his BFA in sculpture. Cande Aguilar, Jr., from Brownsville is a self-taught artist, and he began his career as a musician at the age of 10 and recorded his first album by the age of 13. Angel Cabrales received his BFA in sculpture from Arizona State University and his MFA in sculpture from the University of North Texas . In addition to being the Lead Assistant to fellow public artist Thomas Strich, he is currently a visiting lecturer in Sculpture at the University of Texas at Brownsville. Bernardo Cantu recently graduate from the University of North Texas with a MFA in Drawing & Painting. He currently is an adjunct art instructor at University of North Texas in Denton. Mario Garcia is pursuing undergraduate degree in visual arts at University of Texas Arlington and lives in Dallas, TX. Michael Anthony Garcia received his Bachelor of Arts in Fine Art from Austin College in Sherman, TX . He now lives and teaches in Austin and is a collaborating founder of Los Outsiders, a creative and curatorial collective. Beto Gonzales is from San Antonio. After earning degrees in Philosophy and Art History at the University of Texas at Austin, he studied graphic arts and continues to learn more about new media, including video and animation, as well as continuing his use traditional media. Ricardo Paniagua lives and makes art in Dallas. His works have been in included in a two person exhibition at the MADI Museum in Dallas, the 2011 Texas Biennial in Austin, and was recently named a finalist in the prestigious 2012 Hunting Art Prize. Mother-and-son partners Susan Roth Romans and Jordan Roth operate Ro2 Art, a full-service gallery and consultancy with spaces in the Uptown and Downtown areas of Dallas, working with a diverse group of contemporary artists, most with ties to the North Texas Region. At present, Ro2 focuses on the exhibition and sale of work in all visual media, through a fine art gallery space in the West Village of Uptown Dallas, a progressive, intimate gallery in the historic Kirby Building in Downtown Dallas and a third fine art space, Ro2 Art Downtown Collection, located steps away. The gallery is a member of The Dallas Art Dealers Association and The Uptown Association. In 2011, Ro2 Art was named Dallas' 'Best Art Gallery,' by The Dallas Observer. All works will be on view April 20 – May 5, 2012, which will be open Monday - Saturday from 11am-6pm, and by appointment for the duration of the exhibition. Please join us for the opening reception Friday, April 27 from 6 to 10pm at The Janette Kennedy Gallery at South Side on Lamar, located at 1409 South Lamar, Dallas, Texas 75215.